Before I dive into the review, I wanted to give a quick WOOOOOOOOHOOOOOOOO! 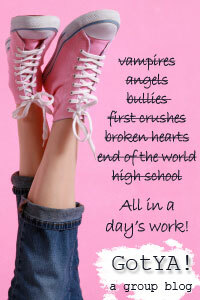 MILA 2.0 is finally off to copy edits, and yes, I’m totally doing the happy I’m Revision-Free-and-I-Know-it dance! No, I won’t be vlogging this particular dance anytime soon. Trust me when I say your eyeballs should thank me (though I solemnly swear I am not wearing a SparkleSpeedo). I AM doing a giveaway though, WOOT! 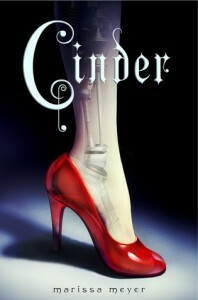 A Cinderella retelling, featuring a cyborg Cinderella and a futuristic New Beijing? Yes, please! I was excited about this story the moment I heard about the premise (I mean, really—HOW COULD I NOT BE?) and oh my gosh, CINDER totally delivers. This book is So. Much. Fun. The world Meyer paints is imaginative and stunningly visual. I love Cinder’s character—she’s compassionate, smart, and more than a little rebellious as a cyborg manifestation of the fairy tale legend. In her world, cyborgs aren’t considered full citizens, and the way Cinder questions her own worth is very poignant. Prince Kai is a sympathetic character, as the son of a ruler who’s rushed into being a man, a boy with his own rebellious streak. Yes, the prince wants to do what’s best for his country, but without being a pawn, and the chasm that divides Cinder’s and Kai’s places in society provides oodles of conflict. I don’t want to spoil anything, but the little twists on all the traditional Cinderella details were awesomesauce, too! And Iko, oh, Iko—your personality chip RULES! Now for the giveaway! I want you to win your own copy of CINDER—either a hard cover, or an ebook! All you have to do is tell me which literary character you think would make a good cyborg, and why. Contest runs until Wednesday, February 22nd at noon PST.